Environmental sensors have been deployed in various cities for early detection of contaminant releases into the atmosphere. Event reconstruction and improved dispersion modeling capabilities are needed to estimate the extent of contamination, which is required to implement effective strategies in emergency management. To this end, a stochastic event reconstruction capability that can process information from an environmental sensor network is developed. A probability model is proposed to take into account both zero and non-zero concentration measurements that can be available from a sensor network because of a sensor’s specified limit of detection. The inference is based on the Bayesian paradigm with Markov chain Monte Carlo (MCMC) sampling. Fast-running Gaussian plume dispersion models are adopted as the forward model in the Bayesian inference approach to achieve rapid-response event reconstructions. The Gaussian plume model is substantially enhanced by introducing stochastic parameters in its turbulent diffusion parameterizations and estimating them within the Bayesian inference framework. 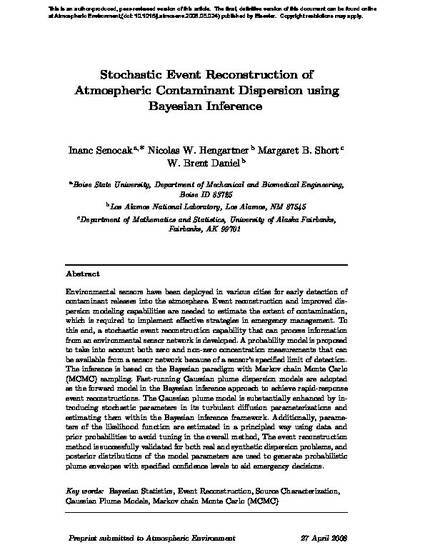 Additionally, parameters of the likelihood function are estimated in a principled way using data and prior probabilities to avoid tuning in the overall method, The event reconstruction method is successfully validated for both real and synthetic dispersion problems, and posterior distributions of the model parameters are used to generate probabilistic plume envelopes with specified confidence levels to aid emergency decisions.